Similarly, mixture of inhomogeneous Poisson processes results in a non-Poisson point process. 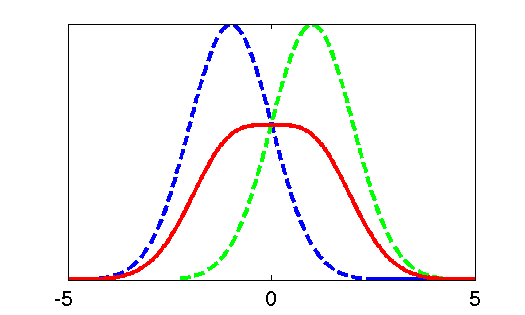 The figure below illustrates the difference between a mixture of two Poisson processes (B) and a Poisson process with the same marginal intensity (rate) function (A). The colored bars indicates the rate over the real line (e.g. time); in this case they are constant rate over a fixed interval. The 4 realizations from each process A and B are represented by rows of vertical ticks. Several special cases of mixed Poisson processes are studied , however, they are mostly limited to modeling over-dispersed homogeneous processes. In theoretical neuroscience, it is necessary to mix arbitrary (inhomogeneous) point processes. For example, to maximize the mutual information between the input spike trains and the output spike train of a neuron model, the entropy of a mixture of point processes is needed. where is the average probability. Conclusion: The conditional intensity function of a mixture of point processes is given by the expected conditional intensity function over the mixing distribution. Daley, Vere-Johns. An Introduction to the Theory of Point Processes. Springer. Interesting! I don’t understand how you have N(0,1) and N(0,-1). Does the second one have negative variance? I tried googling that and ended up in mostly esoteric stuff that I don’t know about. Your chart looks to me more like evenly mixing N(1,1) with N(-1,1). Also, do you mind explaining what is on the horizontal figure in the second axis? Thanks for your interest and for pointing out the errors. The each vertical tick in the second figure represents an event such as an action potential in time. I tried adding more explanation to the text.